CA Bills To Limit Robo Calls! Home » News » Local News » CA Bills To Limit Robo Calls! By BStigers on February 6, 2019. 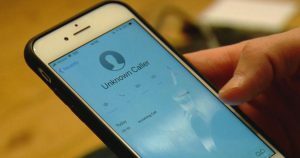 A NEW CALIFORNIA BILL HAS BEEN INTRODUCED WHICH IS AIMING TO STOP IPHONE ROBO CALLS IN THE STATE. IT HAS BEEN ESTIMATED THAT THERE ARE OVER 30 BILLION ROBOCALLS MADE EACH YEAR AND 40% OF THESE ARE SCAMS. THIS BILL WOULD ELIMINATE “NEIGHBORHOOD LOOK LIKE CALLS” WHICH SHOWS UP ON YOUR PHONE LOOKING LIKE A LOCAL CALL. FCC OFFICIALS BELIEVE STOPPING THIS FEATURE WOULD HELP STOP THE CALLS WHICH HAVE BEEN TIED TO IDENTITY THEFT. IF PASSED THE LAW WOULD TAKE AFFECT IN TWENTY-TWENTY.